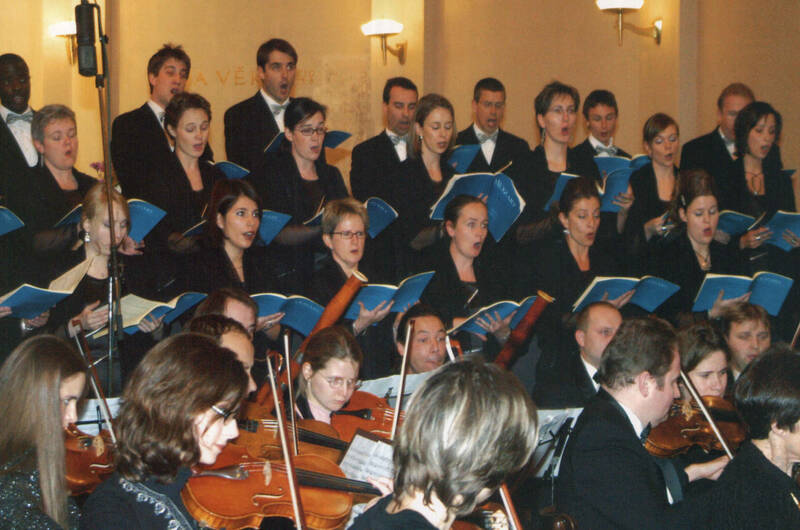 The Advent Sing Prague is organized since 1999 without interruption by music&friends™ for Czech and foreign choirs. 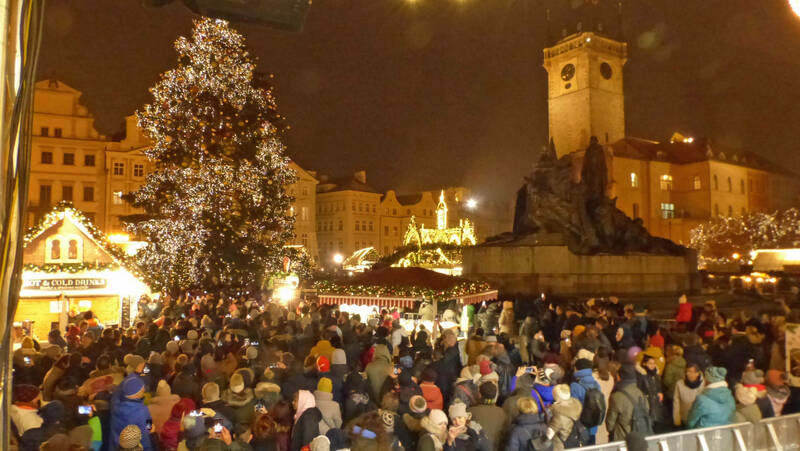 All performances for choirs at the most important Christmas market on the Old Town Square in Prague are organized at the weekends by music & friends™. 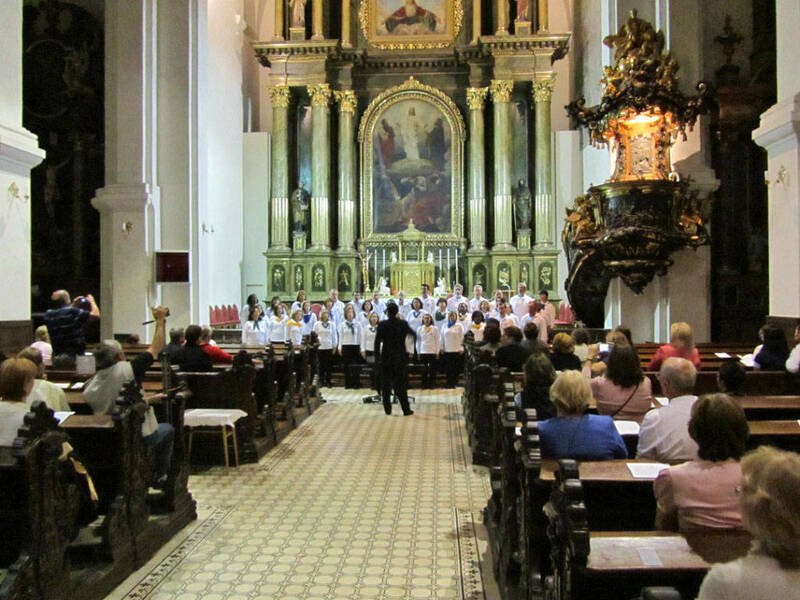 Many choirs have participated several times in Advent Sing Prague in the past years. Concert halls of the Friendship Concerts are in the Academy of Musical Arts HAMU in the Liechtenstein Palace with impressive concert organ and Steinway concert grand piano and the Art Nouveau hall of the Prague Choir Hlahol, in which Smetana was one of the first choirmaster. Day 2: Guided tour in Prague Castle (Hradschin). In the late afternoon open-air concert at the Christmas Market. Optional in the evening dinner cruise at the Vltava River (Moldau). Day 3: In the morning guided tour in the Old Town or Jewish Quarter. Individual lunch and time for shopping. 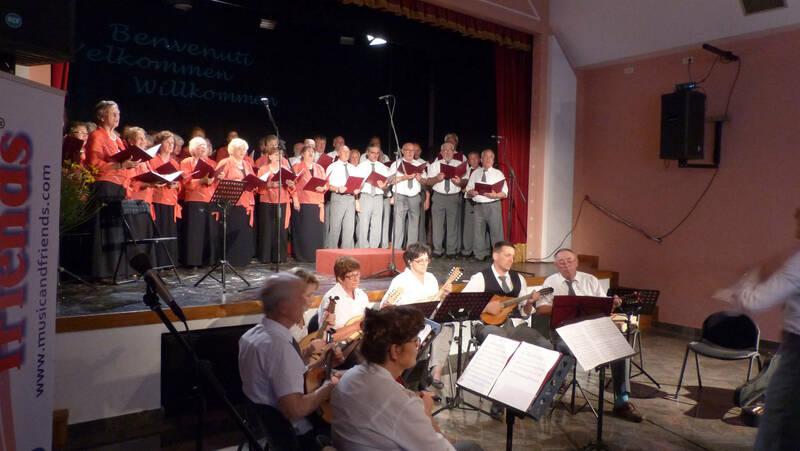 In the evening Advent concert with several choirs in a concert hall or church, followed by a Bohemian farewell dinner. Amsterdam has many colourful faces and places. You probably know about the 165 romantic canals with nearly 1300 bridges, the 600.000 (!) bikes, its famous nightlife and the beautiful flower markets. However, Amsterdam offers more. It has fascinating places of interest; historic monuments, arts and antiques in quaint quarters and fashionable, upscale products on chic shopping streets. Famous museums like the Rijksmuseum (with e.g. the Night watch by Rembrandt), the Van Gogh museum or the Anne Frank Museum take you back to the early days of the Netherlands. Friendship concerts bring a guest choir with 2-3 foreign choirs together and arrange international contacts and atmosphere for all participants. 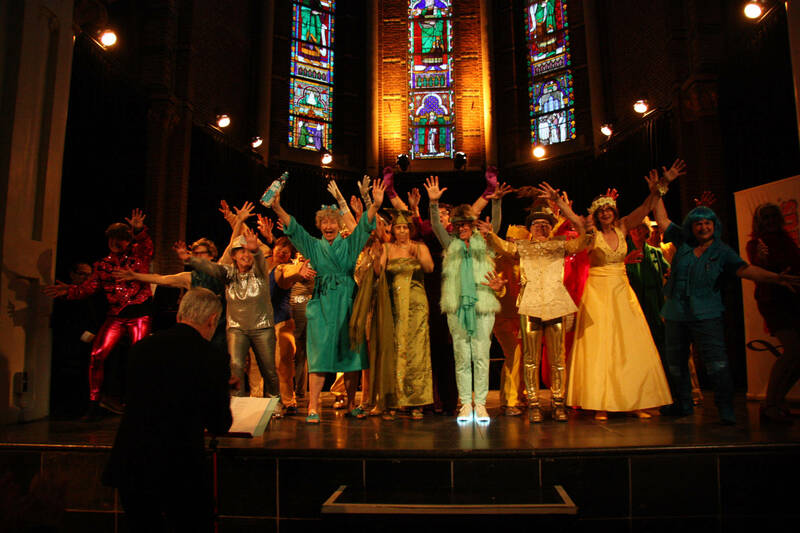 During the common concert, all participating choirs present themselves with a song to their choice in a concert hall in the centre of Amsterdam; the last common song is of course “Tulips from Amsterdam” in Dutch language. The common concert is followed by a gala-dinner with music and an extraordinary buffet. This candlelight evening will be in the mind of the participants for a long time! Each choir will get an individual itinerary - here you see an example for the stay. Friday: Arrival in Amsterdam in the early afternoon. Meeting with the local guide and friendship-concert in Amsterdam or surrounding. Return to the hotel late evening. Saturday: Canal cruise in the morning followed by a guided tour. In the afternoon common concert with all participating choirs, ending with the common song “Tulips from Amsterdam”. In the evening optional festive gala-dinner with an extraordinary buffet. Sunday: Extension with guided tours and e.g. concert in a elder people home. Departure. Possible. For some of the transfers a local coach rental is necessary. The rental can be arranged by music&friends™. The next airports are Amsterdam (AMS), Eindhoven (EIN) or Weeze (NRN). Local transport for all transfers can be arranged by music&friends™. With an extension night, additional performances can be integrated, e.g. in a retirement home or in a church service. The additional costs are shown in the description. Munich, the “Capital with Heart” is with its beautiful surroundings one of Germany most visited cities. This is no surprise because Munich offers so much: the Bavarian lifestyle, Germany’s most popular breweries, and the breath-taking countryside are unique in Germany. Culture and sporting events play a big role among Bavarians, and visitors can count on friendly services. Despite the dynamic lifestyle, there is always enough time to enjoy the comfortable Bavarian ambience. Beer gardens and Coffee shops invite not only tourists but also natives to relax. Furthermore, the traditional restaurants offer a variety of food, like meat loaf, pork and sausages. In and around Munich there are held friendship concerts with several choirs, supporting of a church service and a final concert with all choirs is waiting for the participants. The common concert, where each choir will introduce itself with a few songs, is held in a concewrt hall or church in the centre of Munich. Day 1: Arrival in the evening. Day 2: Guided tour Munich and time for shopping in the afternoon. Friendship concert in the evening. Day 3: Guided tour e.g. Olympic Park or BMW World. In the afternoon common concert of all choirs. Bavarian dinner with music. The next airport in Munich (MUC). Local transport for all transfers can be arranged by music&friends™. The Southern Bohemian province capital České Budejovice (Budweis) is world-wide known for its famous and marvellous beer. But this city offers much more: A medieval city centre with a cosy ambience, in many parts style fully reconstructed a lively university town and good situated between Linz, Munich and Prague. 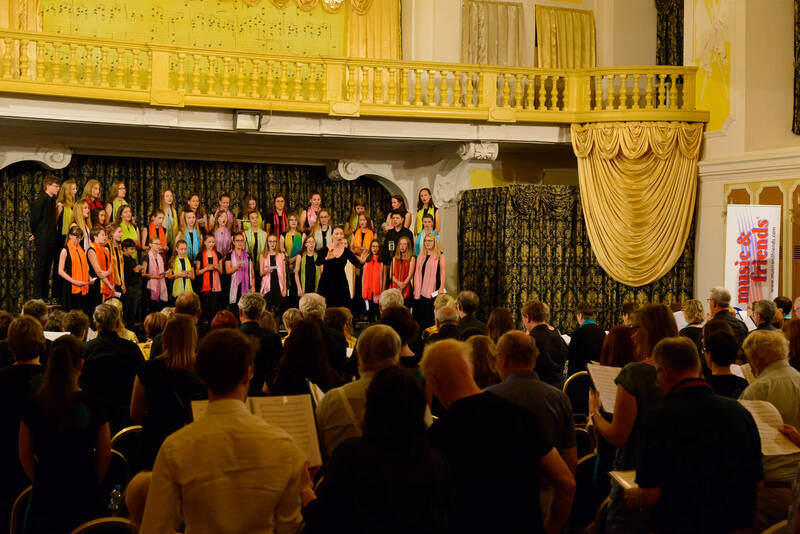 Musical traditions are not only carefully maintained at the universities - in České Budejovice you can find some of the best youth choirs of the country. The organ player and composer Adam Vaclav Michna (17th century) was born in a nearby village with the name Otradovic. His most known composition is the Missa Sancti Venceslai. Guided tours in Budweis and Krumlov are planned as well as a farewell dinner with all choirs to get international contacts. Concert places are in Budweis and in Český Krumlov, an UNESCO World Heritage with a large castle and an old town along the river. After spending the day in this medieval town, the choirs will perform their final concert in the castle in the former winter riding school of the castle, where concerts are celebrated all over the year. Day 1: Arrival in the evening. Dinner in a historical restaurant. Day 2: Guided tour Budweis by walk. In the afternoon e.g. tour in the famous brewery Budvar (Budweiser) or at the castle of Hluboka. Friendship concert in the evening. Day 3: Guided tour in Cesky Krumlov by walk. In the afternoon common concert of all choirs. Farewell dinner with music. The next airport in Munich (MUC) or Prague (PRG). Local transport for all transfers can be arranged by music&friends™. A short program with only 2 nights does not accept many hotels because of the holiday date. Therefore only on special request and with a longer request period possible. Bratislava, the capital of Slovakia, is an old border and bridge city and its castle (hrad) is a landmark for centuries. The downtown is dominated by Baroque buildings from the time of Maria Theresa. Located in the tri-border region Slovakia, Austria and Hungary on the 300m wide Danube River, there are only 65 km to Vienna and 190 km from Budapest. The city offers many attractions and cozy pubs. In the environment of Bratislava there is the town Modrá, which is one of the wine producing areas in Slovakia. Concerts will be in concert halls or the magnificent baroque churches in Bratislava or surrounding with local and foreign choirs. A social highlight of the stay is a folklore evening which shows the musical temperament of the Slovaks. Day 2: Guided tour in Bratislava and in the castle of Bratislava. In the evening friendship concert at the concert hall or in a church. Day 3: In the morning tour to Modrá and guided tour. Lunch with wine tasting. Drive back to Bratislava and concert with several choirs in a concert hall or church, followed by an optional dinner with folk music. The next airports are Bratislava (BTS), Vienna (VIE) and Prague (PRG). Local transport for all transfers can be arranged by music&friends™. With only 2 nights, the arrival on Friday at noon is necessary to have a concert on the same day. Individual activities are very limited. The reduced costs for the short stay are shown in the description. Concerts are held in the colonnades for guests and visitors in Karlovy Vary, Marianské Lázně and Františkovy Lázně. All participating choirs meet for a friendship concert in a nice concert hall. Guided tours and a farewell evening round off the stay to the most beautiful spring season. Day 2: Guided tour in Carlsbad (Karlovy Vary). Concert in the afternoon at a colonade, e.g. the famous Mlynska kolonada. Day 3: Guided tour in Marienbad (Marianske Lazne). In the afternoon concert at the main colonnade, followed by a common concert of all participating choirs in a concert hall. In the evening optional Bohemian dinner with music. The next airport are Dresden (DRS) and Prague (PRG). Local transport for all transfers can be arranged by music&friends™. Because of the holiday date, only a stay with 3 nights is accepted by the hotels. Performances of the choirs are a matinee concert over the rooftops of Barcelona, a very special experience. Friendship concerts take place in the lively centre of the city in various concert halls or churches. A special experience is the common concert of all participating choirs: Each choir presents himself with a song of their choice in the Crypt of the Sagrada Familia, the landmark of the city and next to the tomb of the brilliant Catalan architect Antoni Gaudi. In memory of Gaudi, the choir directors put down put flowers at his tomb before the common final song. This is followed by a dinner with music and singing with Catalan gastronomy and hospitality. Day 1: Arrival in the hotel in Barcelona centre or Barcelona Coast and meeting with the local guide and dinner. Day 2: Guided tour in Barcelona, performance as a matinee concert, guided tour in the centre to the famous Ramblas, the lively heart of Barcelona. Dinner in the city of Barcelona. In the afternoon and evening friendship concert with a hosting local choir in churches or concert halls. Day 3: Second guided tour in Barcelona and free for own activities. In the afternoon a common concert in the Crypt of the Sagrada Familia, the landmark of Barcelonal, followed by a farewell-dinner of all participating choirs. Day 4: Departure or extension with a tour to the Monastery of Montserrat with short performance and visit of a wine cellar or to Girona and Figueras. Because of a busy itinerary during 2 days, a shorter stay is not possible. ♫ Relaxing day at the coastside. ♫ Full day excursion to mountain Montserrat with the Benedictine monastery of Santa Maria (about 60 km from Barcelona). Famous is the statue of the Black Madonna, patron saint of Catalonia. The figure of the 12th century thrones above the high altar in the basilica of the monastery. Short performance after the boys choir, which performs each noon Gregorian songs. Visit of y wine yard and tasting wines before the return to the hotel. ♫ Full day excursion to Girona, well known because of its old town and guided tour. Figueras has been the birthplace of the equally idiosyncratic and famous artist Salvador Dali. In Portllegat you can visit his house before returning to the hotel. 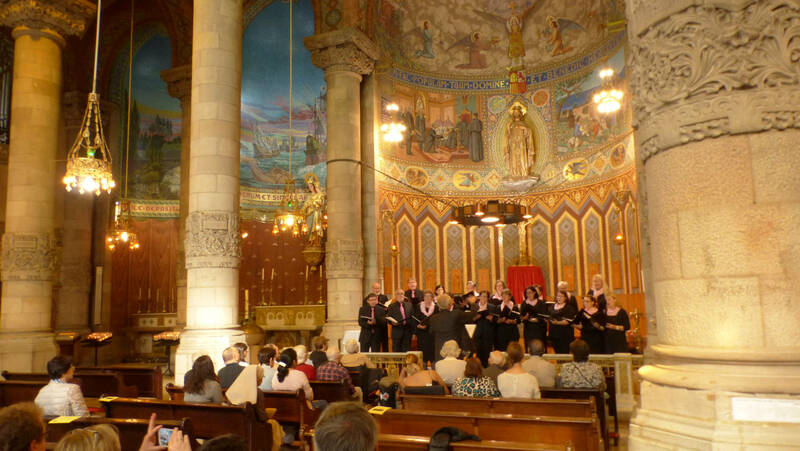 Friendship concerts in churches and concert halls bring together choirs from several countries. The musical highlight is the common concert of all choirs in a magnificent hall or theatre. The musically highlight is the common concert of all participating choirs in a concert hall or theatre. Social highlight is the farewell dinner in a hotel or restaurant by the sea. Typical Croatian specialties and wine of the country provide in a short time for a lively atmosphere until well into the night. This farewell dinner is the best place to communicate with singers from other countries. Day 1: Arrival in the hotel and check-in. Dinner. Day 2: Guided tour in Pula. Rehearsal and friendship concert in the evening in Pula or surrounding. Day 3: In the morning time for leisure or guided tour in Istria or church service. In the afternoon common concert of all choirs in a concert hall in Rovinj. In the evening optional farewell dinner with other choirs and music. Choirs with a longer stay may choose several extensions offered by music&friends™: Extensions with accommodation and guided tours in Istria or extension in Trieste or Zagreb. We would like to invite you to the international choir event Cantate Dresden, which will take place for the 7th time in 2019. It is already a tradition that every year choirs from different regions of Germany and different countries visit us in Dresden and in Saxony. Our hosting choirs and ourselves are looking forward to the many, different performances at the friendship concerts in Dresden and the joint singing at the common concert in the Church of the Holy Cross (Kreuzkirche) Dresden, home of the world famous Kreuzchor. Dresden has been a cultural centre of Europe for many centuries. 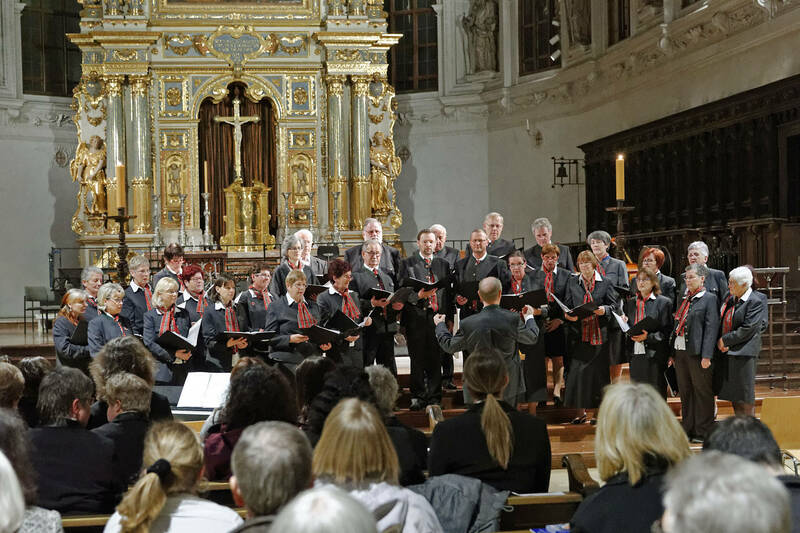 In addition to the baroque architecture and different cultural facilities, choirs are an integral part of musical creation. The three boys' choirs, the Dresdner Kreuzchor, the Dresdner Kapellknaben and the Knabenchor Dresden, as well as internationally renowned vocal ensembles such as the Auditiv Vocal or the Dresden Chamber Choir, testify to this. 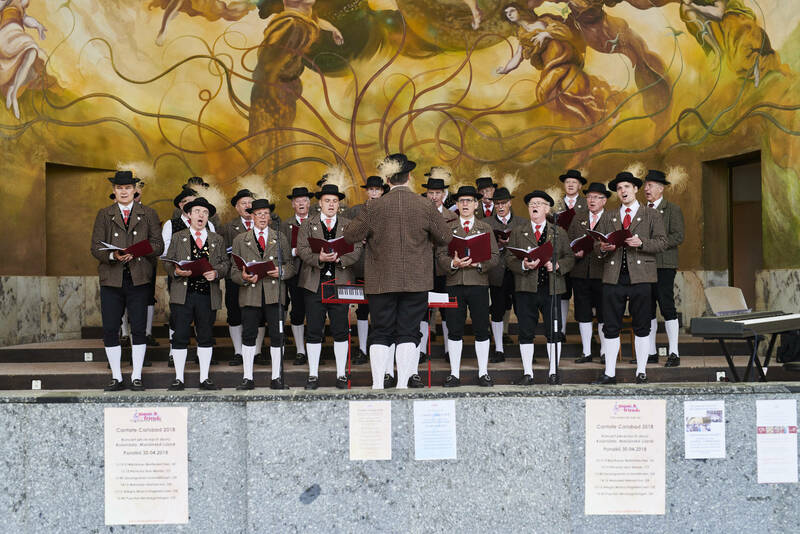 But also the over 30 amateur choirs of the Ostsächsischer Chorverband e.V., which are based in Dresden, represent an essential part of the common singing in large parts of the Dresden population. Correspondingly to this reason, Dresden applies for the title "European Capital of Culture" in 2025 beside two other Saxony cities. In recent years, reports were not solely positive about Dresden and its surrounding! Nonetheless, it remains a city with fantastic people who welcome guests from all parts of the world. Moreover, the Dresden choirs have always been wonderful hosts and are open to all forms of choral music and choral work. Especially at the farewell evening, when language barriers seem to be easier overcome and the moment can be treasured among all participants. Particularly in times like these, intercultural exchanges are more important than ever, for which Cantate Dresden has made its contribution for many years. Therefore, we look forward to your participation and especially to your songs. Through the last century the Saxonian metropolis has developed to one of Germany's most attractive cities. The old towns preserved buildings, the famous rebuilt “Frauenkirche” (Church of Our Lady), the pedestrian zones on both river banks, and a diverse food service industry attracts thousands of tourists and visitors daily from around the world. From the 13th century on, the city became an electoral and later a royal residence of the republic of Saxony. Today, the city is not only the states capital but also its cultural, academic and economic centre of the region. After the disastrous destruction during world war II, the city passed through many years of rebuilding and refurnishing with the highlight of a fully reconstructed ”Frauenkirche” (Church of Our Lady) which opened its gates again in 2005 and which is the place for short performances during the festival. 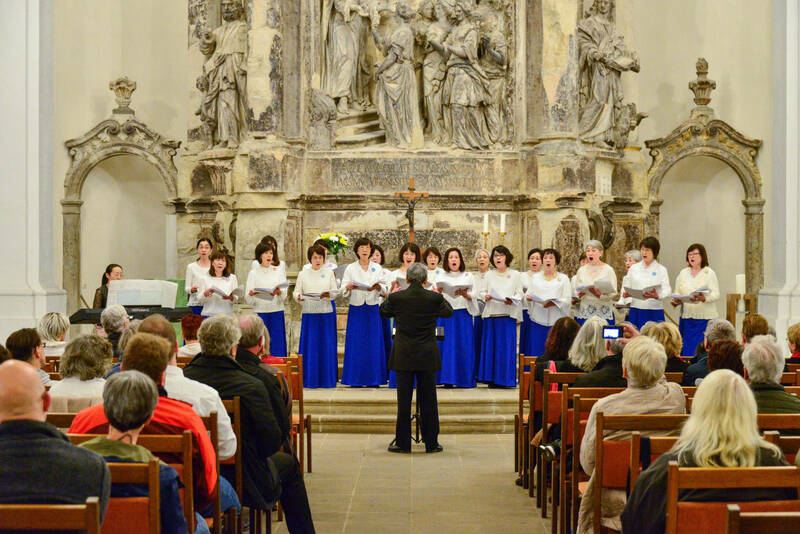 Choirs from different nations meet at friendship concerts in and around Dresden on Friday and at a common concert with all participants, which is the musically highlight of these days. At the end of the common concert, all choirs sing a special composition with the name “Cantate Dresden” which has been composed especially for this choir festival. The common concert will be 2019 again in the famous Kreuzkirche (Church of the Holy Cross), the largest church in Dresden and home of the world famous Kreuzchor. Short performances in the Frauenkirche (Church of Our Lady) are another musically highlight. The evening is planned with a Saxonian dinner with all choirs. Day 1 (Thursday): Arrival and dinner. Day 2 (Friday): In the morning guided tour in Dresden and short performance in the Church of our Lady (Frauenkirche). Free for shopping and in the afternoon or evening friendship concert. Day 3 (Saturday): In the morning optional guided tour e.g. to Meissen. In the afternoon common concert of all choirs, followed by an optional Saxonian farewell-dinner. Day 4 (Sunday): Church service and departure. The next airports are Dresden (DRS) and Leipzig (LEJ). Local transport for all transfers can be arranged by music&friends™. With only 2 nights in Dresden, the possibilities for individual sights and the number of performances are very limited. To perform in the Frauenkirche (Church of Our Lady), the arrival must be latest on Friday morning. Time for addional guided tours (e.g. Semper Opera or the atelier of Meissner Porcellan is not possible within the short stay. Choirs with a longer stay may choose several extensions, offered by music&friends™: Extensions with accommodation, guided tours and concerts in Prague, Berlin or other cities in Bohemia or Germany. These workshops bring together up to 3 choirs with a Prague orchestra and soloists to an intensive workshop. The final highlight is the common performance of a mass of Dvořák, Fibich, Michna or Mozart in Prague. A workshop of these types presupposes an ambitious choir which is willing to face other mentalities, languages and musical traditions with a high discipline. Target for the choir shall be an own qualitative development with a corresponding motivation and the knowledge from a choir work in an international environment. The conductors of the choirs will be involved into the complete development and share the conduction of the final performance. Why Prague: As a cultural centre in Europe Prague always has inspired composers and musicians and a unique cultural scene until today. The available infrastructure of concert halls and professional musicians allow organizing high-quality workshops for a reasonable price.